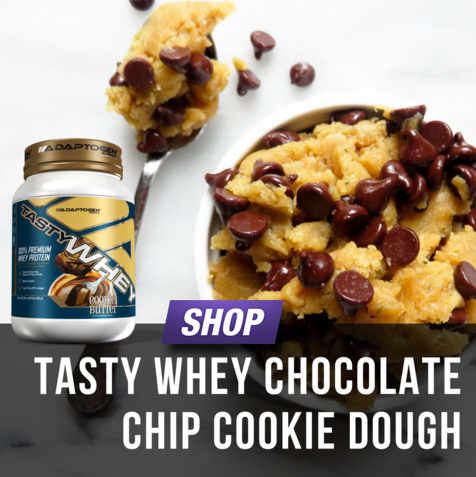 Everyone loves cookie dough… Tasty Whey Cookie Butter Cookie Dough is the perfect snack to satisfy your sweet-tooth cravings and pack in that protein that you need to benefit gains from your workouts. This is a single serving recipe. To share with others, simply double or triple the recipe! Whisk together the Tasty Whey, coconut flour, and salt in a small bowl. Make a well in the center. Pour in the milk, stevia, and vanilla, mix until fully incorporated (The mixture will look crumbly). Using a spatula or the back of a fork, gently press down on the mixture until it sticks together. Serve immediately!